He Has A Great Temperament! The Bull Mastiff dog is extremely large and strong. Despite his impressive size and determined appearance, he is also described as a sweet dog. The founding stock for this breed, which was developed in England, came from crosses of 40% Bulldog with 60% Mastiff. Although this breed has a history that dates back to 1765, it was not until 1924 when judging was permitted. Initially, the Bullmastiff was used for tracking and pinning down poachers although with proper training, stopped short of biting. Because his job took place mostly at night in the dark, the coat colors at that time favored dark brindle for better concealment. Throughout the years, the Bull Mastiff dog has been used by law enforcement, military, and private owners as guard dogs. Today, the Bullmastiff has become a popular family pet even with the massive body size. From the shoulders, males measure between 25 and 27 inches and females from 24 to 26 inches. Regarding weight, males generally weigh up to 135 pounds while females are slightly smaller, growing to about 120 pounds. The only downside to the Bullmastiff dog is the short life expectancy, which is typically less than 10 years. Because the Bull Mastiff dog has short, somewhat rough hair, grooming is extremely easy. In fact, brushing several times a week and an occasional bath will take care of the grooming needs of this breed. On the plus side, this breed of dog sheds very little, making it a good indoor pet as well as outdoor dog. Because this mastiff’s feet carry a significant amount of weight, they should be checked regularly for abrasions and the nails kept short. One other feature to bear in mind is that Bullmastiffs are notorious for excessive drooling. 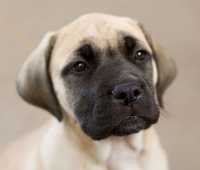 As with a lot of large breeds, the Bull Mastiff dog is at high risk for hip dysplasia. Because of this, it would be important to purchase this type of dog from a qualified breeder that only breeds dogs that are OFA Certified with normal hips and elbows and can provide proof that the parents of any puppy of interest have been so certified. Other health concerns of the breed includes eye disorders including Dominant Progressive Retinal Atrophy and Canine Multifocal Retinopathy, Ectropion, and Entropion, allergies, hot spots, boils that develop on the lips, and bloat. Unfortunately, Bullmastiffs are also at greater risk for cancer than other breeds. While the very size and appearance of the Bull Mastiff dog can be intimidating, the truth is the breed has a great temperament. In fact, this dog is extremely loving, affectionate, and docile. Although considered mild-mannered, this breed can become aggressive toward strangers and other dogs if provoked or overly aroused. Bullmastiffs are also very loyal to the entire family, highly intelligent, and very calm. Due to the dog’s large size and extreme power, this breed should be well-socialized early on, plus obedience training would be critical. In addition, a confident owner would be best, someone with the experience and ability to be in a leadership role to prevent issues of control. Often, this breed is referred to as a “lazy dog”. On most days, they are perfectly content just lying around, although as a means of promoting good health, regular walks are very important. However, for people who want a large dog with a couch potato mentality, this one would make an excellent choice. Although some people keep the Bullmastiff outdoors, the truth is this breed prefers cooler conditions. If left outside, it would be essential for the dog to have proper shade, an appropriate doghouse, and perhaps a kiddie pool filled with cool water. However, dogs of this breed are generally more comfortable indoors. And, being somewhat sedentary, very sweet, and shedding little, they make excellent house pets for anyone, even people living in apartments without yard space. Not because of temperament, but due to large size and strength, this dog would be better suited for adults or families with older children. That being said, problems rarely exist if purchased as a puppy and raised with children who are taught proper handling of pets. Even so, it would be important to know that if a child were hyperactive or involved with rough housing, this breed might think the child is in danger at which time it would react by becoming aggressive toward the “predator”. While generally good with older children, they should never be left alone with a Bull Mastiff dog - particularly one that presents dominant character traits. Although a sweet and docile animal that loves attention, the Bull Mastiff dog is powerful, making this breed a poor consideration for many elderly people. Even though this dog needs little exercise, most elderly persons would have trouble controlling the animal when out on walks. Because of these challenges, we would not recommend this breed for most elderly households or first time dog owners. If you're a proud owner, breeder or fancier of this breed, we'd like to hear from you. There's nothing like first hand information to help someone who is considering a particular breed for their family and your knowledge can be enormoursly helpful. Please share your insider information and experiences of living with and loving this calm yet awesome dog breed. Up-to-date and accurate information on the breed including its personality and history, how to select a puppy, potential health issues, daily care and feeding. Also includes a good selection of pictures. Overall a worthwhile resource for new and existing owners.